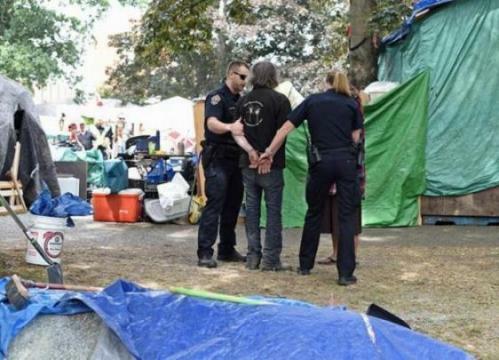 Victoria Police Department officers arrest a man at Tent City on Burdett Avenue after the man allegedly attacked a CTV cameraman who was filming an interview with another resident of the homeless encampment Friday afternoon. Victoria police have arrested one man Friday afternoon after a CTV cameraman was attacked from behind while filming in the homeless encampment in a downtown city park. The man was taken away in a police cruiser.